Another harebrained escapade involving the Fister clan. 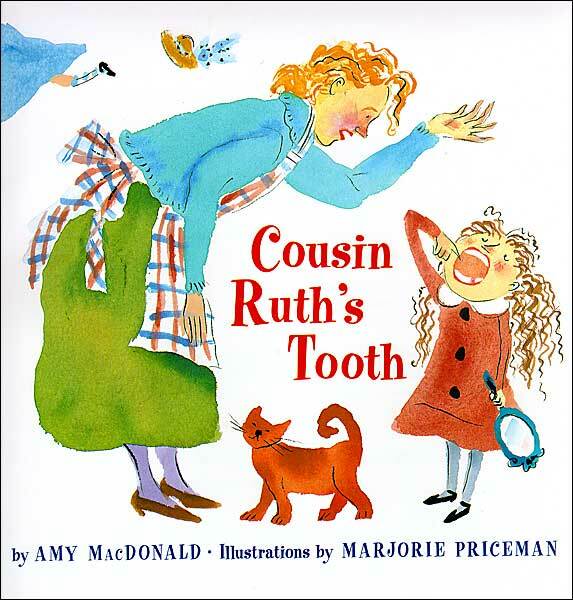 This time Cousin Ruth’s tooth is missing, and no one can find it, despite searching high and low – and in the most ridiculous places (“Check the hatbox! Check the cat box! Look inside the VCR!”). Once again the Queen comes to the rescue, helping Ruth announce the solution to the mystery. Originally I thought I might try to write a story about a beaver who loses a tooth, but before I got very far with that, I realized how much funnier it would be if the Fisters lost a tooth. I didn’t intend to write another rhyming book – when I finished Rachel Fister’s Blister I swore that I would never write another book in rhyme – it’s really hard! But I couldn’t resist this one. Mary Lee and Uncle Lance! ” Uncle Walter …” etc. So Uncle Walter is the famed editor Walter Lorraine. Mary Lee is Mary Lee Donovan (my editor!). Matilda is Matilda Weltner, another legendary editor. And so on. But no one knows that little fact, except me. And now you.